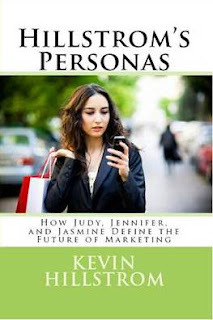 Kevin Hillstrom: MineThatData: Hillstrom's Personas!!!! Judy, Jennifer, and Jasmine have made a difference! For three months, we've talked about how our wonderful ladies define the future of marketing. We have Judy, a traditional shopper who still adores catalogs. We have Jennifer, an online maven trained to adore free shipping. And we have Jasmine, the future of marketing, a social/mobile/local shopper with limited funds. Now, our thoughts are captured in a fifty-eight page booklet titled "Hillstrom's Personas"!! There are three ways to learn about Hillstrom's Personas. Purchase a color booklet on Amazon, $14.95 (to be available in the next few days). Purchase the Kindle version, $4.95 (available right now). Read older blog posts for free. Of course, you'll want the souvenir, right? This has been the most popular series ever written on this blog. In some ways, it represents a unifying theory ... there's room for catalog marketing to matter (Judy), there's room for online marketing to matter (Jennifer), and there's room for social/mobile/local to matter (Jasmine). We reinforce the concept of segmenting an audience. We reinforce the concept of applying a relevant strategy to a target audience. We reinforce the notion that product matters. If you're walking in to an Executive meeting and you want ammunition for explaining why your direct mail program doesn't work, or why your Twitter presence only has 339 followers, bring a copy of "Hillstrom's Personas" to the meeting ... heck, have a copy ready for everybody in the room!